Russia does not need Mistral in order to conduct aggression against Georgia, Russian Prime Minister Vladimir Putin said on June 9, the day before beginning an official visit to France. “It is not necessary to use such facilities as the Mistral ship for aggressive purposes, as we can use our other equipment to attack any target in Georgia from Russian territory, but I hope that, God willing, we will never see a military conflict between Russia and Georgia, never. Georgia and Russia's other neighbours should not fear the Mistral purchase because Moscow has no plans to use it to undertake any kind of aggression. The Russian side is doing its best to ensure there is no repeat of the conflict with Georgia,” Putin told RIA Novosti. The Russian media are reporting that Russia plans to cut its Black Sea fleet in Sevastopol due to problems with the defence budget. Defence Minister Anatoly Serdiukov said at the Upper House of the Russian Parliament on Wednesday that he was going to discuss this matter with colleagues in Ukraine, from which Russia leases the Sevastopol base. However, Serdiukov did not specify how many servicemen would be dismissed when the fleet is downsized. 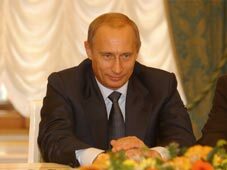 The Georgian Authorities have expressed doubt about Putin's statement. "Russia is doing its best to provoke us and make us shoot, however we will not be provoked anymore. Russian would be very pleased to conduct further aggression against Georgia, but in the present situation there is no threat of this, due to Georgia’s capacity to defend itself and the international support the country is receiving. If these factors did not exist, Russia would start another war against us,” Temur Iakobashvili, Minister for Reintegration, stated on June 10. He explained why Russia needs the Mistral. "The Georgian-Russian conflict showed that the Russian Army is one great heap of junk. It made it obvious that its equipment and training is old fashioned. By purchasing the Mistral Russia is trying to fill this gap,” Iakobashvili said. Iakobashvili also underlined the importance of the meeting between Presidents Saakashvili and Sarkozy prior to Putin’s visit. " Mikheil Saakashvili was invited before Putin as a political gesture, a further sign that France and the European Union are not going to reconcile themselves to Russia's occupation of Georgia and its attempt to turn Georgian regions into independent states,” Iakobashvili stated. Military analyst Irakli Aladashvili, Editor in Chief of military magazine Arsenali, has told The Messenger, "Before the Russian military aggression of 2008 the Georgian Government thought that our self-defene capacity and level of international support were very high, but this did not stop Russia attacking us. In terms of military readiness and international support, our prewar situation was considerably better. Putin was correct to say in his interview that Russia does not need the Mistral to carry out military aggression against Georgia, as Russia has sufficient means for doing this already. So I do not think Russian aggression can be excluded,” Aladashvili said.